Even as an iPhone user, you just can't ignore the existence of Samsung's flagship Samsung Galaxy S8, one of the best Android phones on the world. The battle between Galaxy S7 and iPhone 7 moves to a new stage and it seems never to be an end in the near future. For those who get tired of iPhone or prepare for a new device, Galaxy S6 is definitely worth a try as it brings a totally new experience to iPhone users. However, iOS and Android are completely two different things. So it takes a bit of time to get used to the new device. And this is the original ideal of writing this tutorial down to accelerate the transition. When you got a new phone, the first thing is to import content and files from the old device to the new one to make it work, such as music, photos, videos, emails, Apps, etc... But it will take hours to finish the transfer process when you are going to do it by your own hands. Guess how much time it takes to type 200 photos or songs on the new phone? Luckily, there is a huge time-saving solution out there to reduce the pain of manual transfer tool. Phone Transfer is a powerful and smart data transfer program designed for smartphone users. 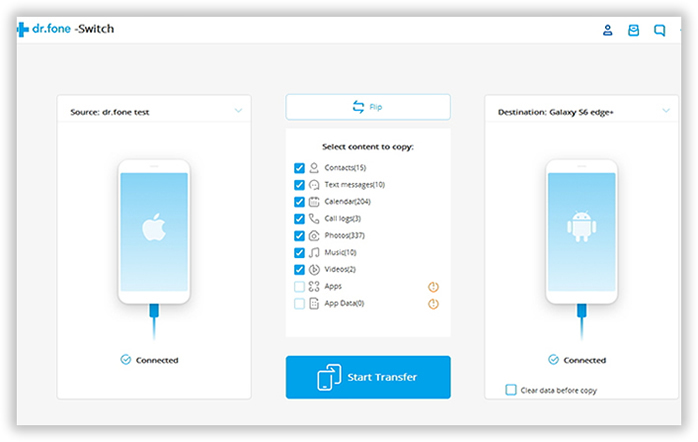 There are only a few clicks required to transfer hundreds of files from one phone to another including photos, music, videos and other files. And most importantly, it only takes a few minutes to complete the transfer tasks, even for the transfer of a large number of files. You can't find an easier and faster solution than that on the market because all of the dirty work is done in background by the software. The next few sections explain how to use these applications. Start out by downloading and installing the program first on your personal desktop machine, it now fully supports the latest Windows OS and Mac OS, don't worry about the installation issue, just follow the built-in wizard. After installation, open it and the main screen shown like this. At this point you can selected an appropriate mode for your requirement, here you should select Switch option in the primary window of this program. Then you have to connect the two devices to a computer on the corresponding USB port. If the computer didn't detect the USB driver, please install the missing one immediately. When everything is Ok, the program should list the two devices on the main screen as source and destination phone. When the program detected the phones, it starts to scan and analysis the stored content on the source phone and will list the found items on the main screen, such as music, photos and videos. It's up to you to decide which kind of files being transferred from source phone to the destination one. In default, it will only transfer contacts and photos. For other items, you have to check them by yourself. When everything is prepared, click the Start Transfer button to start the transfer process. Usually, it only takes a couple of minutes to complete the task. With Phone Transfer, you're not gonna to worry about data transfer anymore. It's just a piece of cake to copy 1000+ files from one phone to another, no matter it's an Android phone, iPhone or Nokia Symbian powered phone. It takes care all of the dirty work and free up manual power, which is the essential function of automated software. Besides file transfer, you can also use this program to back up phone data to computer or ease the content and settings to protect the safety of your persona data being leaked when you sold it out to someone else.